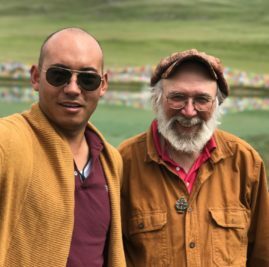 Two Konchok Foundation board members, Lyndon Comstock and Jessie Litven, were part of a group of Westerners who visited Surmang Dutsi Til this summer. A major purpose of their trip was to meet with Chöseng Trungpa Rinpoche (left with Lyndon Comstock) to learn about the remarkable progress made in his plans for the monastery. 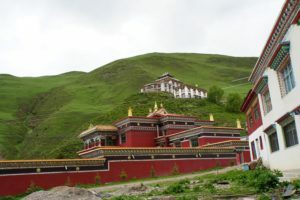 The centuries-old castle at Surmang, known as the kargenma, served as the home for the monastery’s abbots—the Trungpa lineage—until its destruction after 1958. It has now been completely rebuilt. The new building is beautifully finished, inside and out. Once the final touches are completed, Trungpa XII Rinpoche will take up residence in it this fall. The monastery’s lhakang (main shrine hall) is also in the final stages of rebuilding. Additionally, a lesser project, the reconstruction of the monastery kitchen, should be completed by next summer. Trungpa Rinpoche, who is now 28, has been supervising these rebuilding projects with the assistance of Khenpo Tsering. Trungpa Rinpoche has also assumed many other responsibilities relative to overseeing the monastery and its annual practice cycles and to benefit the local population. Trungpa Rinpoche told us that he will issue an invitation for the Western sangha to attend the forthcoming consecration and celebration, together with the exact dates, later this year. The event will take place in or about late July 2018. Konchok Foundation will pass this invitation on to you once we receive it, together with information about how to participate. While the Konchok Foundation representatives were in Tibet, they and the other Westerners with them visited Trungpa XI Rinpoche’s birthplace in Geje. More than thirty of the Vidyadhara’s relatives, most of whom live in and near the town of Dzato, the nearest town to Geje, hosted us. 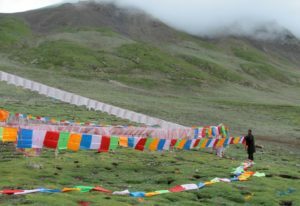 The site, at 16,000 feet and marked by rock cairns and prayer flags, is a remote and beautiful location. Although it needed no further enhancement, the birthplace was graced by a rainbow during the visit. On the north side of the birthplace is Mukpo mountain (Jingri Mukpo, to be exact); on its east side is a valley called Surmang that terminates in snow covered mountains; both names predate the birth. Watch video of the visit to Geje. Jessie Litven interviews one of Trungpa Rinpoche’s relatives. 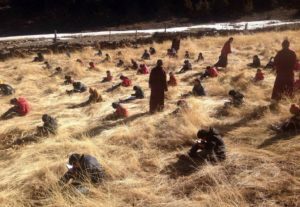 Building efforts continue at the Surmang nunnery, supervised by Chögyam Trungpa Rinpoche’s nephew, where the planned next step is a new shrine hall. Konchok Foundation continues to provide a modest level of support; much more is needed. The next children’s program will start in December 2017. The program continues to focus on basic literacy and similar skills. Providing support for Surmang. 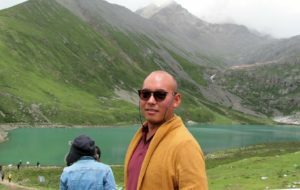 If you would like to make either a one-time or a recurring donation of any amount to support the Surmang shedra or Konchok Foundation’s other program activities, please visit here. Be sure to let us know if you want your donation restricted to a specific program. Photos courtesy of Gaye Carlson, Jessie Litven, Wendy Davis, Lyndon Comstock and Khenpo Tsering.